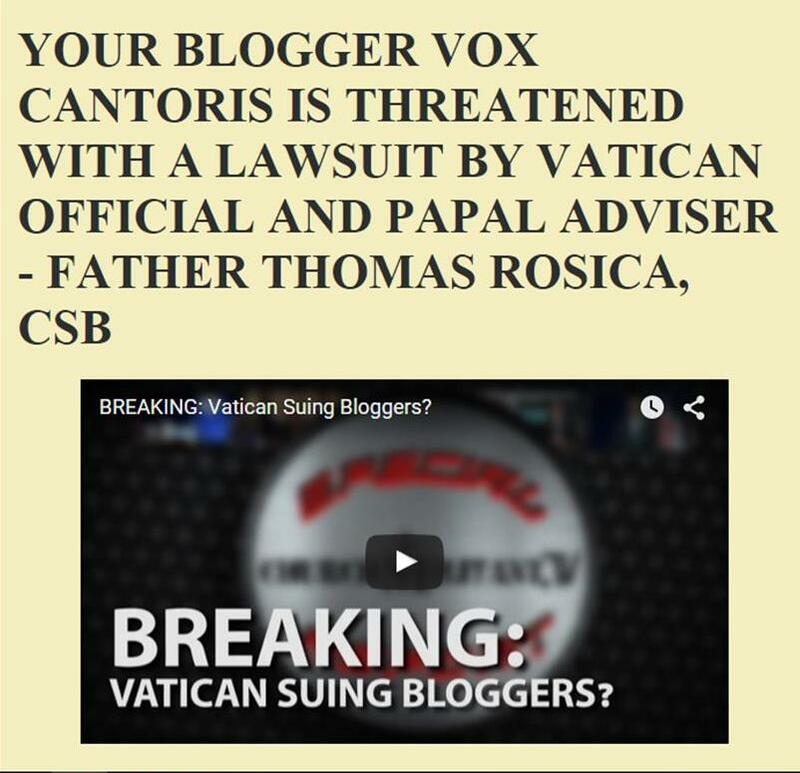 Vox Cantoris: CATHOLIC FUNDAMENTALISTS COMMIT VIOLENT ACTS! 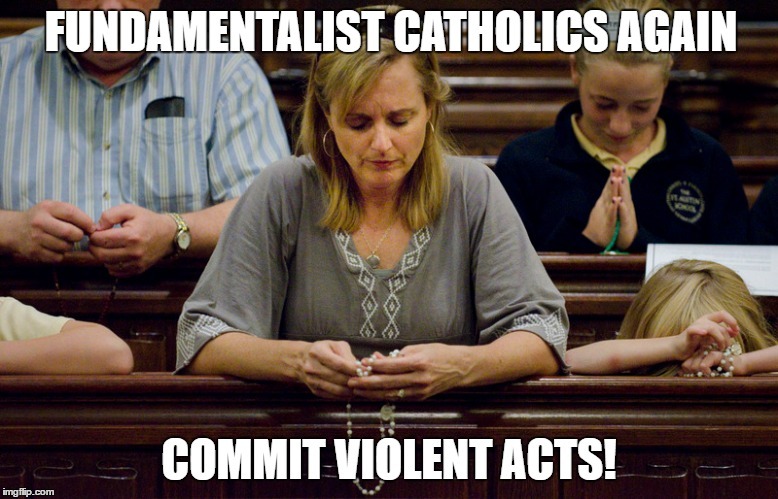 CATHOLIC FUNDAMENTALISTS COMMIT VIOLENT ACTS! 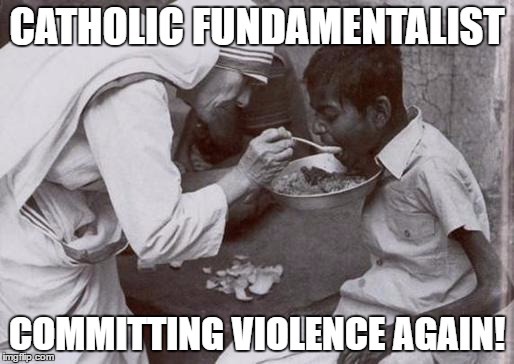 Mother Teresa was by no means a Catholic "fundamentalist". Worshipping Buddha kinda get one off the running..
Other than on a few faithful Catholic blogs, where is the outrage over such a lie? The silence is so disheartening. You, Vox, are a true soldier for Truth. God keep you. They hate us because they are a sect of sodomites priests and this is why they are rebelling against God. 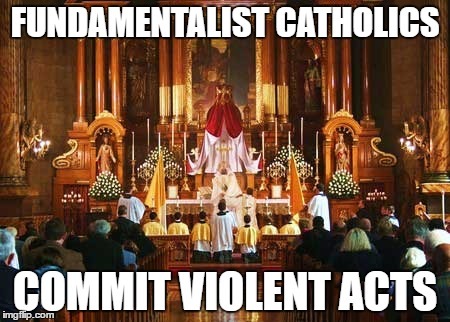 Jesus Christ must have been the first 'Fundamentalist' leaving behind the Ten Commandments, the Holy Sacrifice of the Mass, the Sacraments & telling His Apostles to go forth & teach all nations. Everything He taught has now been repudiated by Modernist Popes & Hierarchies who obviously consider they know better than Him. Fruitcake doesn't even begin to describe their demonic antics. Fruit Salad certainly encompasses the masses of the proletariat who consider it 'their right' to `practise every conceivable vice known to man via Satan no matter whom they offend or lives they adversely affect while doing so. Silence from our Pope & Hierarchy on such ill-spent lives, no instruction or good example from many of them on how to prepare for the only life that matters - the afterlife, salvation with Our Lord or damnation with the Devil. Of course, when they themselves don't believe in such things how can we expect otherwise. If the NWO Church comes to pass then there will be no need for the clergy, churches, shrines,pilgrimages, prayer as there will be no-one to worship GOD. nazareusrex.....BAM! Summed it all up in 20 words. The Pope has now ventured from proclaiming anti Catholicism to putting Christians, and especially Catholic Christians in real danger. He is in essence inviting a 'caliphate' on 'radical Christianity', and not only from ISIS. Torquemada approves your post, my dear friend Vox!